Few actors can consistently surprise and entertain you over the course of decades. Johnny Depp has been doing that for me since 21 Jump Street. He was in the Bop magazines I pretended not to read. He was in the first Nightmare on Elm Street movie. He was a total teen heartthrob. Then he started getting weird and was even better. He hooked up with John Waters and Tim Burton and Jim Jarmusch. He had that Winona Forever tattoo updated. And he is constantly straddling the line between mainstream heartthrob and total weirdo, making eccentricity seem downright foxy. I don't know, they both look pretty darned cool, especially compared to the old TV show! 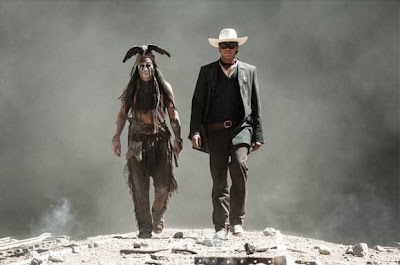 The exclusive trailer for The Lone Ranger debuts on iTunes tomorrow at 7:00am PST. 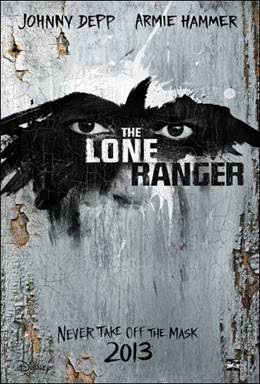 THE LONE RANGER gallops into theaters on July 3, 2013! I won't miss anything he's involved with!